Video clip synopsis – A broadcast studio at Radio Redfern in the late 80s. Christina Spurgeon talks about the importance of providing media services to remote Indigenous communities to the culture, identity and language of Aboriginal Australians. Broadband MP4 caama_bb.mp4 (8.6MB), suitable for iPods and computer downloads. 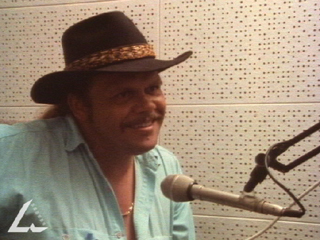 Radio Redfern is an excerpt from the film 88.9 Radio Redfern produced in 1988 by the Film Australia National Interest Program. 88.9 Radio Redfern is a portrait of Sydney’s Aboriginal radio station. This video clip is on the From Wireless to Web website, produced in 2005. The interview with Christina Spurgeon was recorded for the website. write an imaginative short story. Writing Standard: students write sustained and cohesive narratives that experiment with different techniques and show attention to chronology, characterisation, consistent point of view and development of a resolution. They compose a range of other texts, such as feature articles, webpages and workplace texts. They proofread and edit their own writing for accuracy, consistency and clarity. The activities in this digital resource are relevant to the Interdisciplinary Learning strands of Level 6 Communications (Listening, Viewing and Responding standard; Presenting standard), and Thinking Processes (Reasoning, Processing and Inquiry standard; Creativity standard). In 1972 the first Indigenous-produced community radio program went to air on 5UV in Adelaide. Two years later ABC Radio started broadcasting in several Indigenous languages to Aboriginal people and Torres Strait Islanders in Far North Queensland. At the same time in Alice Springs, two Aboriginal people and their non-Aboriginal associate – John Macumba, Freda Glynn and Phillip Batty- helped to establish the Central Australian Aboriginal Media Association (CAAMA). Their goal was that Aboriginal voices be heard throughout the world and for Aboriginal people to take ownership and control of their own future through a strong, vibrant media centre. That goal became a reality in 1980 when the Central Australian Aboriginal Media Association (CAAMA) was established. Today CAAMA’s radio network broadcasts on 8KIN FM. From the Radio Redfern archival clip, comment on the ways in which community radio helps Aboriginal people, and explain whether the spoken commentary presented in the clip would be likely to be broadcast on ABC and commercial network mainstream radio stations. Comment on whether Aboriginals as a community are given a ‘voice’, and how you believe they are presented in the mainstream Australian media (radio, TV, newspapers). Research then prepare, draft, edit and proofread an illustrated, informative two-page article for a magazine aimed at teenagers, about the history, growth, activities and importance of CAAMA. Format the article using word-processing or desktop publishing software. Write an imaginative short fiction story in which either Radio Redfern or CAAMA plays an important role in the plot, setting and the lives of the characters.